I added a wreath that I made years ago. I just tucked in a few more grasses and leaves. Cheese pumpkin and faux pumpkin, potted kale and mums. Beautifully done, Karen! I love how you did your urns. Your wreath is beautiful. I can't beleve that's a few years old. BEAUTIFUL!! 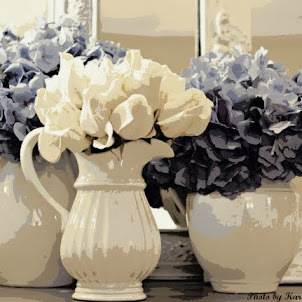 Love that wreath and the way you filled those urns! I love the way you decorated your front porch. Kale always reminds me of fall. Everything looks so nice and welcoming, Karen. I love your presentation! Everything is simply beautiful! I have yet to post my front. I put mums in my urns that hadn't open yet so things have been looking a bit bare. 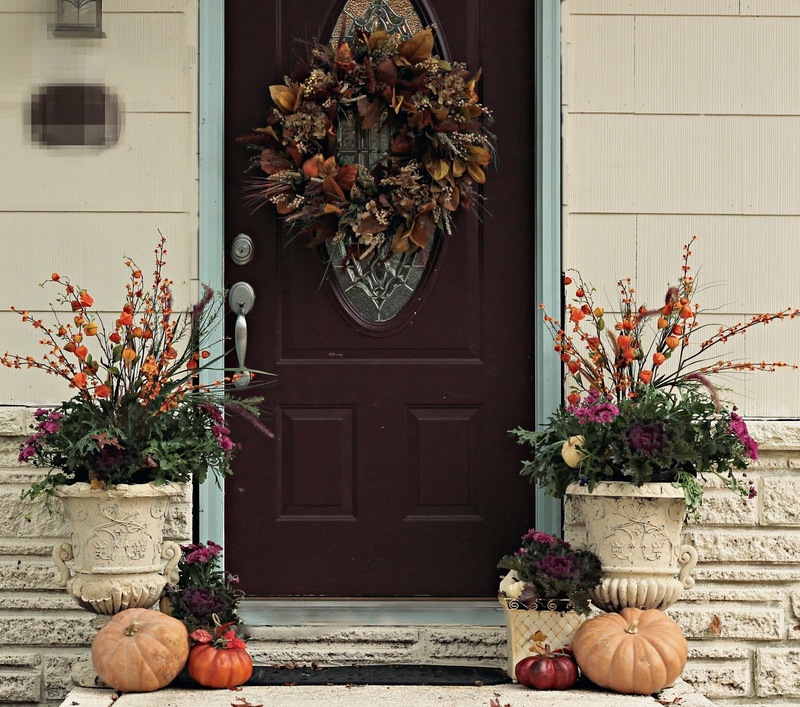 Your wreath looks gorgeous, and, if you don't mind my asking, do you have a dark purple door? The second picture looks like it might be, but it could be just the lighting. If you do, I love it! I've been dreaming of a dark purple door! If not, I do love your door with the leaded glass, whatever color it might be. Your porch is beautiful and that wreath is just gorgeous! Great looking front porch, all ready for fall now. Love the urns, with the pumpkins sitting in front. What a stunning porch! I love the color combination too - gorgeous! Procrastinating did work for you! Your porch looks beautiful! Love your choices. Your porch looks wonderful all Falled up! The wreath on your door is so lovely. Your porch looks beautiful, Karen! I love the way you filled those pretty urns! It all looks beautiful.. Great choices! Gorgeous! It looks like a magazine cover! It looks so pretty. I have got to get some cabbage for my front porch. Love that purple color for fall. Well done! Your porch is stunning. I must say that I've come down with a case of porch envy! My mums died, and I need to get off the computer and go throw them away! Just beautiful! !I LOVE the wreath against the door! You've created an, oh, so stylish, entry! So warm and inviting. Your exterior colors really work well together, the light blue trim makes it special. Great job with the wreath! That is lovely! I didn't really do anything outside this year. I like to get some fun pumpkins but I decided to forgo it this year. I'm ready to thing about Christmas decor too! Your front porch is wonderful! Love it! So worth waiting for! Just gorgeous! I love how lush and warm your wreath is!!! So pretty. Hope to see you at My Dream Canvas. I love your pretty porch!!! I too am already planning a large Christmas but, had to have a little fall just because I LOVE FALL! Your pumpkins look so pretty & who can resist pansies & kale? Enjoy! And thanks for sharing. Oh my...it was sure worth the wait. It looks fabulous. I think the kale is perfect! You have a lovely front porch and did a wonderful job with your bargain finds! What a lovely front porch....thank you for leaving a sweet comment ! Nature is my favorite way to decorate! Fruited and plants are cheap and amazing. I love your porch!